Actor Danny Dyer was the first of a new batch of celebrities to trace his ancestors as the new series of Who Do You Think You Are? kicked off on BBC One. Born and bred an East End boy, Danny was delving into his past in the hope that a strong male figure would emerge on his family tree. The episode started with Dyer tracing his relatively recent past in the East End of London. His initial research took him as far as the Buttivant family who had firm roots in Mile End Old Town. Albert and Ann Buttivant, Danny's 3 x great grandparents, were reported to have ran the local workhouse but on closer inspection, Danny discovered that they were regular inmates rather than management. Given their poor backgrounds it was inevitable that the family may have fallen foul of the law at some point and this was Danny's next avenue of research. 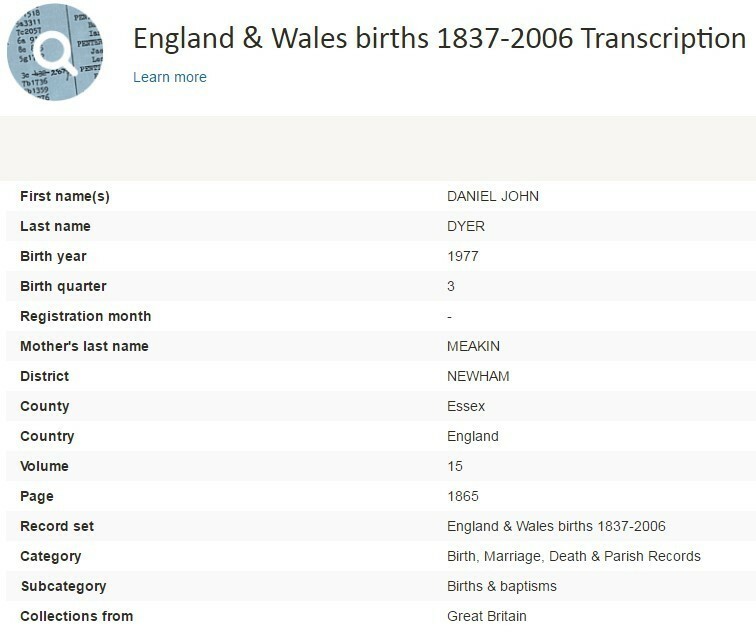 Dyer decided to search Findmypast's comprehensive crime records, the largest British collection online, and was astounded at what he discovered. Mary Ann Buttivant, daughter of Albert and Ann, and Danny's great-great grandmother, was convicted of concealing the body of her dead baby in 1878. Reading further into this tragic story, it was realised that the crime was an unfortunate attempt by Mary Ann to deliver her baby on her own that went dreadfully wrong. She was only 17 at the time, pleaded guilty and served no jail time. Understandably, this revelation upset Danny Dyer who hoped his journey into his family history would become a little brighter. And it did! To his delight, Danny discovered that his 10 x great grandfather, Robert Gosnold, was a member of the landed gentry who fought in the English Civil War. As a defeated Royalist in the war, Gosnold would go on to be stripped of his wealth and his family quickly fell down the social standings of the time. However Gosnold's mother was part of the Tollemache family who are still considered gentry to this day. Danny went to meet his distant relative Lord Tollemache. It was during his time with Lord Tollemache that Dyer started to uncover his deep connections to royalty. Danny's 12 x great grandfather Lionel Tollemache was married to Catherine Cromwell, the great granddaughter of Lord Thomas Cromwell, King Henry VIII's right-hand man and 'the most controversial man in British history'. He is Danny's 15 x great grandfather. Concentrating on this royal pedigree, we then discovered that Thomas Cromwell's son Gregory married Elizabeth Seymour, sister of Jane Seymour, Henry VIII's third and favourite wife. From there, Danny discovered the unthinkable – he is a direct descendant of King Edward III! Twitter was buzzing with opinions during last night's opening episode of Who Do You Think You Are? Here are some of our favourite reactions to the show. What a brilliant 1st episode of #WDYTYA. @findmypast@MrDDyer - have the ancestors in London workhouses but haven't found any Kings yet!